It’s cloudy and gray this morning, the parking lot and cars wet with light rain. The air is icy and moist as we leave for the day, but splinters of sun begin to cut through the clouds. We are mired in Chicago’s traffic as we try to make our way out of town on Interstate 294 and 90. While we’re stuck in traffic, silver commuter trains whiz by on elevated tracks. A double-decker Metra train flashes by. Chicago’s skyscrapers poke up into the low clouds, looking strange with their tops “cut off.” On the outskirts, we pass Comiskey Park, home of the Chicago White Sox, and miles and miles of railroad freight yards. Now rolling through Gary, Indiana, we have a brief view of Lake Michigan and the industrial rust of the steel mills. Steam still rises from some of the stacks and towers, and the railroad yards are nearly full, but the mills are not what they used to be. Gary is Indiana’s ninth largest city, but has lost over half its population since its peak population in 1960. The city was founded in 1906 by the United States Steel Corporation, but in recent years the company could not compete with foreign-made steel, thus many layoffs and declining population. The twin ribbons of the highway stretch before us, leading us through forests and farms and eventually to the outskirts of South Bend, Indiana, home of Notre Dame University. 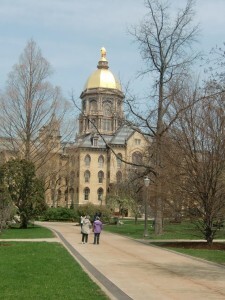 Soon, the gold dome of Notre Dame appears through the trees. The campus is very attractive, most of the buildings faced with layered light gray brick. We are thrilled that we are going to have lunch on the campus with the students. We vie with the students as we try to find our way through the maze of food choices. We bumble around while the students who are used to the food court-like atmosphere scramble unerringly to the various stations. Finally getting the items we want and paying for them, we take our trays into the East Dining Room with its high vaulted ceiling and high, arched windows. This immense space is packed with students, the hall resounding with the clatter of dishes and silverware and the collective sound of their voices. It’s exam time, and several students eating with us are concerned or worried about them. We enjoy the lunch as well as our conversations with the students. It was nice to be among young people again with so much of their lives still ahead of them, so much to look forward to. We walk on the wide area of green and trees that form a long quad between the buildings and visit the exquisite chapel with its golden dome. Nearby is the football stadium. The sun is radiant now, bringing out the colors, especially the greens of the lawn. We move on to the book store and the visitors center which is shaped like a church. One interesting display is of Notre Dame’s gleaming golden football helmets and the way they are “polished” before every game. On our way out we pass St. Mary’s College, an adjunct to Notre Dame. We roll down Interstate 90, then turnoff at Highway 31 and head north. We pass former corn fields, only the stubbles left after cutting, then pass into Michigan. I’m surprised to see so many vineyards, still in the dormant stage, so far north. We pass farms and woods, carpets of dead leaves beneath the naked trees. We arrive in Holland, Michigan, pausing at the Fairfield Inn long enough to carry our luggage to our rooms. We’re on our way to the Tulip Time celebration near downtown. Many people are at the carnival rides and food stands there, a number of girls and women dressed in Dutch costumes, or their version of them, complete with wooden shoes. We gather with many others in Centennial Park to watch costumed kids dance around a non-operating central fountain. They are cute with their gestures, their little high voices and the clomping of their wooden shoes on the brick walkways. Later, we watch people who dance in the streets in groups, performing on three sides of the park at the same time. They dance to the tunes of Dutch songs blasted over loudspeakers, the hollow clatter of their wooden shoes on the asphalt blending with the notes of the music. All the dancers wear Dutch garb, both men and women, and seem to be having a great time. The event is truly something to see. One of the purposes of the trip is to see tulips growing, but we have seen very few. The city officials explain that due to the especially hard winter, spring and the blooming of tulips has been delayed. I had imagined that we would see fields of bright-colored tulips, rows of dazzling color, but a blooming tulip is hard to find anywhere. Somewhat disappointed, except for the Dutch dancing, we retire to our motel rooms for a good night’s rest. 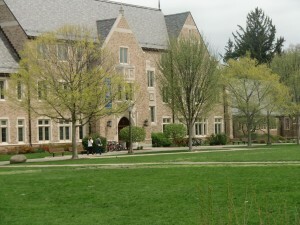 The Notre Dame campus is striking with its green lawns and light gray bricks. 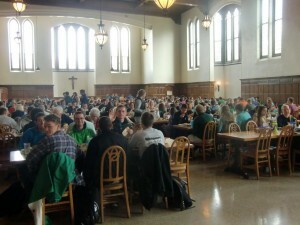 We enjoyed eating with the students in the great dining hall. The famous golden dome of Notre Dame's Cathedral is visible for miles.